I’ll never forget that wedding. It was a picturesque location, under the lights of the Opera House & Sydney Harbour Bridge. A beautiful late summers evening by the water. The band was playing, people were dancing, and the wine and conversation was flowing freely. What a fantastic wedding, right? I’m here to celebrate the union of two lovely people, and yet I’m stuck at a table, slowly filling with dread while listening to a drunk married father of two small children drone on about how my entire house is about to be swallowed up by baby stuff like some kind of Stephen King version of Hoarders. And do you know what? He was right. Babies are small but my goodness they can accumulate a huge amount of crap. They need strollers, playpens, nappy bags, car seats, prams, bouncers, baths, bath toys, boxes of nappies, boxes of wipes, multiple changes of clothing – seriously these buggers go through 4 outfits a day sometimes, play mats, special breathable blankets & pillows, stuffed toys – OH THE STUFFED TOYS,. 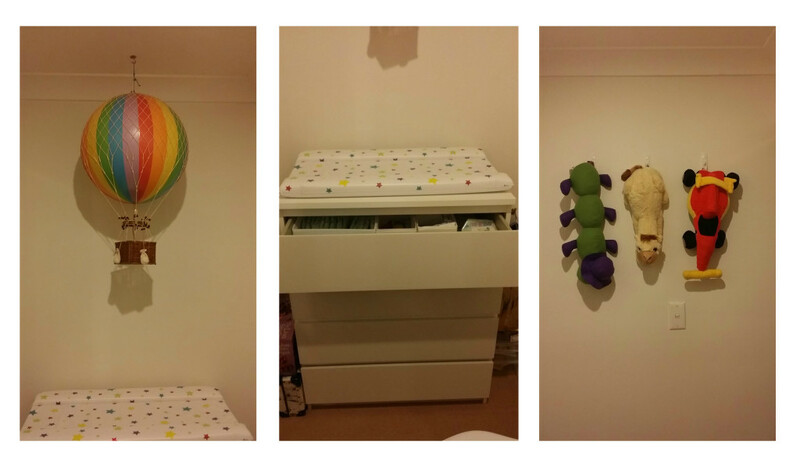 I ended up sticking the soft toys on hooks on the walls. This stuff will seriously overrun your house. Yes, babies accumulate lots of crap. But even if you don’t have a spare room to put the baby in, you can maximise your available space through some simple pre-planning. 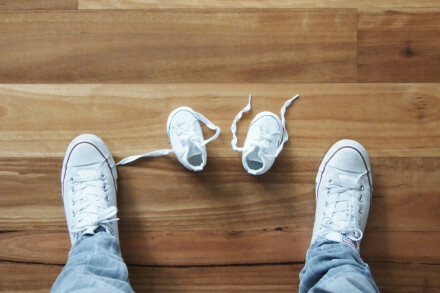 In fact, to save space at the moment, we keep our baby in a closet… Before you freak out & give me the ironic ‘father of the year award’ & obligatory eye-roll, it’s not quite as bad as Harry Potter living in a shoebox under the stairs the stairs so don’t call DOC’s. We’ve actually been lucky enough to convert a walk in wardrobe in our main bedroom that we’ve converted into a baby room. It’s a small space (around 1m x 3m) but we’ve managed to fit his bassinet, a rocking chair & small table for breastfeeding & a chest of draws from Ikea. Rather than install a specialist change table, we’ve put all his change equipment (nappies / wipes / creams etc) along with his towels in the top drawer & covered the top with a change-mat. We’ve also set up a rocking chair & small table for feeding during the middle of the night, hung a model hot air balloon (a decoration from our wedding reception) from the ceiling, and hung a picture & a selection of soft toys on the wall, part decoration – part functional storage. Hey, it’s not going to win any style awards – but it at least works most of the time. 1) Ditch the specialist change table. They’re bulky, ugly and take up precious space. Instead, grab a chest of drawers from IKEA, organise the top draw with all your nappy change gear, and stick a change mat onto the top. Voila! Change space & clothes storage in one. Alternately you can go for an integrated crib with built in change table & drawers built or even a space saving fold down change table. Dad note: Often you’ll end up having the change table in the baby room / nappy bag in the kitchen our lounge for easy access – make sure you get a portable change mat (these often come in a nappy bag set up). That way when you and your little human are hanging out watching TV & they have a No3 accident, you can keep watching football in the lounge while changing the little one. No one needs to carry a leaking child through the house. 2) Use your hidden space well. Get to your local hardware store & Invest in some Plastic rolling tubs for under the bed or crib. These make GREAT storage for all those extra jumpsuits and clothing items that you’ll be given from friends and family that don’t quite fit yet. Also, invest in some draw dividers for the baby dresser – it helps you fit everything in the space & keep it organised and easy to hand at the same time. 3) Walls are not just for pictures. Sure – you COULD use the wall for inspirational photos or kids paintings. But utilize the space on walls (and behind doors) with some heavy duty hanging hooks. Hang the babies stuffed toys, laundry hamper, even your collapsible stroller or pram on walls or behind doors to keep your floor space open. Dad note: Installing Hanging hooks are a nice excuse to get the tools out as a legitimate part of ‘decorating’ the baby nursery. Makes you feel a little more useful than applying stickers of flowers and lambs onto the walls. 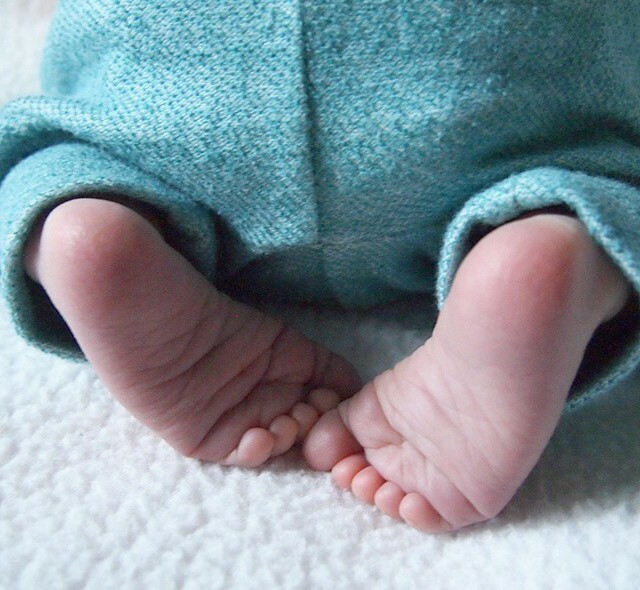 Finally, just remember to remind yourself that if you find a few baby items left around the house when you find yourself drowning under a pile of random baby clothes, spew covered feeding blankets and unwashed nappies, that the important thing isn’t how clean your house is, it’s how loved your baby is. Also, if you feel like you’re struggling with space – check out this stylish set up in a 400 square ft (around 35 square meters) 1 bedroom NY apartment. I’m a little jealous of the hanging crib. Previous storyThe three stages of impending fatherhood nerves. Next storyThat Dad Life feed. We re going to have 2 kids in less than 440 sf as of April. We never meant to have even one kid in that footprint but you can find a way! I just ran across your blog and can t wait to view more about how you tackle living with one kid in your tiny space. So inspirational!